It’s been a month since the earthquake and tsunami in Japan, and it still preoccupies much of my attention since it’s still affecting several of my friends. I was actually supposed to go to Tokyo in April to explore the dance scene there, but had to shelve those plans in lieu of the disaster. It somewhat left me in limbo location-wise, but if you’ve been watching my Twitter or Facebook posts, I’ve been coping decently by sublet-hopping every month. It’s been a month, but slowly the world shifts its attention to more “pressing” matters, such as the tanking economy, high gas prices, and conflicts in other parts of the world. Japan’s tragedy was news then, but it’s not so much news now if you’re not Japanese. Should our focus wax and wane depending on where the media attention is? Hey, whatever happened to Haiti? News media is steering our attentions wherever they want and that’s a strong reason why I don’t follow the news. If something’s important, it will reach me somehow. Two weeks ago, I attended the funeral of a friend younger than me. It wasn’t pleasant, yet it served as another reminder to not take for granted your loved ones and to live each day as if it were your last. I converged with several friends whom I haven’t seen in years, and we found ourselves playing catch-up with each others’ lives… at a funeral. Did it really have to come to that? But, returning back to my thoughts for today – Japan. Japan is a great country. Many people like Japan because of it’s extreme fashion, crazy pop culture, animation industry, or awesome electronics. In my last post on Japan, I wrote about how I loved Japan for other things such as politeness, super-honesty, and diligence amongst other things. It’s not acceptable to be individualistic at the expense of others. The above image was taken by a friend in Sendai, right in the middle of the earthquake zone. The people in the photo have been lining up patiently for hours on end for their ration of basic supplies. What’s remarkable is that everyone’s lining up with space to spare for everyone’s comfort. They’re not concerned about people cutting line – it just won’t happen. I can’t imagine even seeing a 10-person line like this in an average fast food restaurant without people looking over shoulders or complaining about the service. 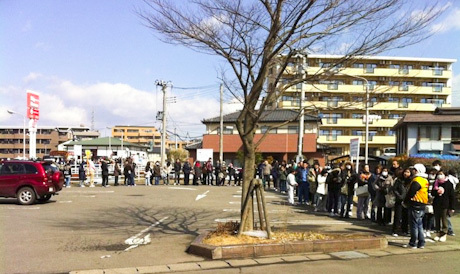 I first noticed spacious lineups in Osaka, Japan at a newly opened Krispy Kreme store (see last Japan post), but to see it in a disaster region is something else. Furthermore, people only took what they needed, and not hoarded as much as they could get. This is in stark contrast to some people’s reaction to say, the Y2K bug. Stealing and looting is almost non-existent. If we rewind bag to Japan’s last major earthquake in Kobe, the same contrast was evident in comparison to the L.A. riots which happened around the same time. It’s our quest to be individualistic, or as I’ve heard many time before – “finding ourselves” – that the ego and our selfishness manifests itself. This shows up in Western concepts such as more is better, and constant, unsustainable economic or corporate growth. How about taking a zen approach where less is better? How about recognizing that there is a greater happiness than our own? Believe it or not, it feels good to be part of the humankind collective, to put ourselves secondary knowing it increases the Gross National Happiness. Understandably, my Japanese friends take pride in how their fellow nationals have responded in the aftermath. Just poking at individualism sounds like the start of a communist manifesto, but it’s not. Creating too strong of an identity for ourselves is what causes us to differentiate, and thus separate, ourselves from one another, and with it creates conflict. To see our common journey and unity seems a much more harmonious way to live than say, survival of the fittest. Some might say it’s too idealistic to work completely, but at the least, it seems much less stressful. So let’s learn some things from the Japanese. Let’s wear surgical masks in public whenever we have a slight cold. Let’s live within our needs and not wants. Let’s live in a way where we are naturally considerate of others. For 5 days, all I could was do something that does not require electricity such as reading books or playing card games. At the beginning of this inconvenient life, I felt bored. Now, however, it is acceptable for me because I feel like I went back to my childhood and could find beautiful hearts that we have through helping each other. Also, on the street, I was surprised by absolutely fantastic stars because of the complete darkness. When we stop living as “human”, the earth changes itself to the nature. That was like a message from it to humans. I have no question about that this earthquake will be a chance for us to think about what we are. To help raise the spirits of my friends in Japan, I’ve launched a translation project to make risingbean.com in Japanese. Please share with your Japanese friends, and to my friends in Japan, stay strong and unite! This is another good article, and I certainly agree with the overall sentiment. It’s a shame that social darwinists has twisted Darwin’s original meaning of the concept of natural selection to be “only the strong survive”, leading to widespread misunderstanding of one of the most important scientific theories ever. The accurate concept of fitness within the context of evolution is simply being fit enough to survive and procreate. So what traits are beneficial to fitness? Within human society, as with other social creatures, good social skills, working together, and caring about the health of the group (family, tribe, country, etc.) are very important, as you clearly described in this article. I would add that Japan was probably better prepared than any other large-scale human group to weather this extreme dose of natural selection, one of the 5 largest since earthquakes were first measured in the 1800s. That’s the first time I’ve heard the term “social Darwinists”, but now I’m intrigued about it. I remember reading a book or listening to an audiobook on how it’s “good to be good” – exactly what you were writing about, Seth. Would you happen to remember it? I definitely believe as humans, we are more than capable to act consciously beyond our basic needs. I definitely plan on writing about my experiments on moving beyond my instincts and basic needs. That’s a beautiful mantra to live by. I strongly believe that if we practiced empathy each day, the world would change very quickly. It’s a shame that we can’t even leave our bicycle outside for a moment these days without succumbing to fear of it being stolen. Thanks, Graham! I think that’s the first time I’ve been quoted! Speaking of bikes, I remember in Japan, I left my bike unlocked wherever I went. It’s really nice to be somewhere like that – small town honesty in a big city. Nice post. Thanks for writing it. I think the quote Graham pulled out spoke the most to me as well. I think I live that way. And I think most people (at least here in the US) don’t. I live in a “town” in South Carolina so small that we just got a place on the map a few years ago. I drive down the road and see jet skis on trailers, unlocked, waiting to be used by the owners. Bikes left out front, windows open with nobody home, people hosting parties at their houses where anyone can step in to have a drink and a good conversation… It warms my heart to know that there’s an entire country out there like that. If I move out of my little town, I’ll be sure to give Japan a good hard look. I’ll definitely spend some time there, thank you so much for sharing, and God bless. I grew up in a town where you could go to 7-11 and leave your car unlocked or even running (to keep the heater going) as you go inside to get something. I now live in a city where I lock my car each time I go to 7-11 and even check the back seat as I enter the locked car. Times have changed I find I even lock my car as I drive around town now, for safety reasons. We can all make a difference by just being honest and courtesy to one another, one day at a time.